At the cellular level, the best-established morphological correlate of synaptic plasticity is the turnover of dendritic spines. Abnormal spine turnover is associated with a variety of Neuopsychatric and Neurodegenerative disorders, ranging from decreased synaptic plasticity in depression models to gradual loss of synapses in Alzheimer’s models. Dendritic spines are minute cellular organelles (approx. 1-2 micrometers in size) that comprise the post-synaptic part of the cortical synapses (primarily glutamatergic). Measurement of spine turnover can be done using single-photon microscopy (e.g., confocal) in cultured cells or in ogranotypic brain slices; however, the relevance of data obtained in these in vitro preparations is low compared to the intact brain in vivo. Two-photon microscopy is the only technique that allows imaging dendritic spines and quantifying their dynamics (turnover) in a living mouse’ brain. 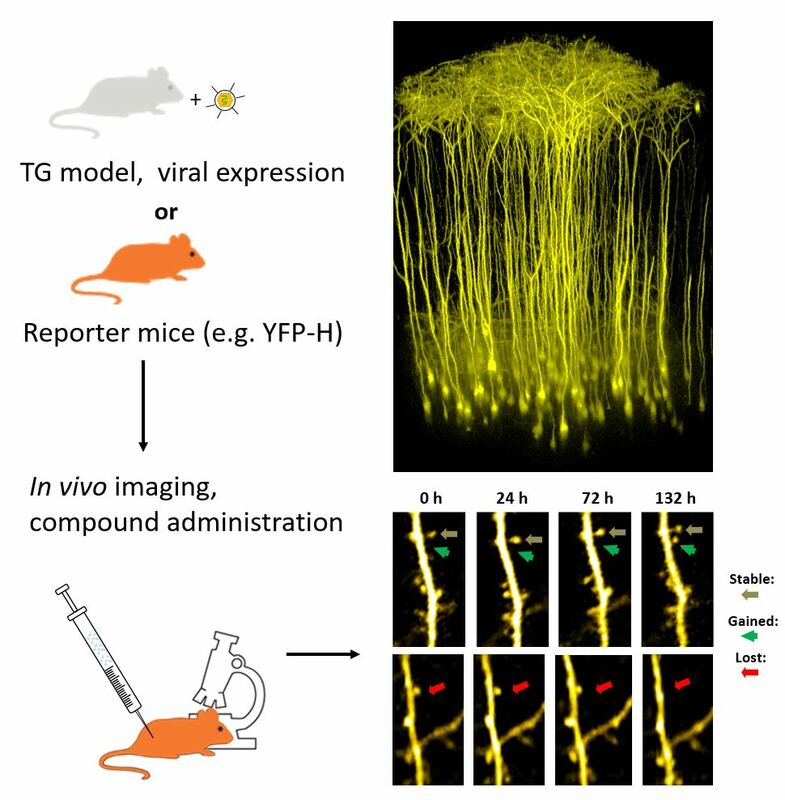 We use viral expression of fluorescent proteins, as well as “reporter” mice, for in vivo microscopic analysis of spine turnover. Accumulating recent evidence shows that general anesthetics (including the commonly used Ketamine) have strong and lasting effects on spine turnover. This is why all spine imaging studies are performed at Neurotar in non-anesthetized, awake and behaving mice. This type of studies is enabled by our proprietary device called Mobile HomeCage (which was initially developed to facilitate our contract research studies in vigilo, i.e. in awake mice). Pryazhnikov E, Mugantseva E, Casarotto P, Kolikova J, Fred SM, Toptunov D, Afzalov R, Hotulainen P, Voikar V, Terry-Lorenzo R, Engel S, Kirov S, Castren E, Khiroug L. (2018) Longitudinal two-photon imaging in somatosensory cortex of behaving mice reveals dendritic spine formation enhancement by subchronic administration of low-dose ketamine. Sci Rep. 24;8(1):6464. doi: 10.1038/s41598-018-24933-8.